Also serving communities of Shepherdstown, Charles Town, Berkeley Springs. There are 11 Assisted Living Facilities in the Martinsburg area, with 4 in Martinsburg and 7 nearby. The average cost of assisted living in Martinsburg is $3,730 per month. This is higher than the national median of $3,346. To help you with your search, browse the 25 reviews below for assisted living facilities in Martinsburg. On average, consumers rate assisted living in Martinsburg 4.1 out of 5 stars. Better rated regions include Winchester with an average rating of 4.3 out of 5 stars. Caring.com has helped 5 families in Martinsburg find high-quality senior care. To speak with one of our Family Advisors about assisted living options and costs in Martinsburg, call (855) 863-8283. Located in the tip of West Virginia's Eastern Panhandle region, Martinsburg is known as the "Gateway to the Shenandoah Valley" and is acclaimed for being one of the fastest growing cities in West Virginia. While populous, the town still caters to its senior community by offering 11 assisted living facilities, four of which are in Martinsburg proper and seven of which are located in nearby communities. These facilities are strictly regulated by the Department of Health and Human Resources (DHHR), Office of Health Facilities Licensure and Certification (OHFLAC). Locals often pay lower prices on things like groceries and miscellaneous goods thanks to the low cost of living in Martinsburg. The city's cost of living index is at 90, compared to a national average of 100. Seniors may need to consider that health care and transportation costs are slightly more expensive than the national average though. Summers are typically mild in Martinsburg, where temperatures average between 56 degrees Fahrenheit and 87 degrees Fahrenheit. Winters are often slight chilly, but manageable for most seniors, where temperatures range between 24 degrees Fahrenheit and 49 degrees Fahrenheit. Seniors who have trouble managing allergy symptoms or respiratory illness may find themselves breathing easier in Martinsburg, where the pollution index is 16 times better than the national average. The air quality index is also better by around 17 percent. The Martinsburg area has considerably higher property and violent crime rates and seniors living here are only considered 3 percent safer than those in other cities. When compared to other cities in the state, the town has a 98 percent higher crime rate. The Martinsburg area is home to world-class facilities, including Berkeley Medical Center, West Virginia University Hospital - East and Martinsburg Veterans Affairs Medical Center, in the event of medical emergencies or illness. Martinsburg has an array of community resources for seniors, including the Berkeley Senior Center, an organization that provides nutritious food plans, enrichment programs, transportation to local events and senior outreach to residents 60 and older. Assisted Living costs in Martinsburg start around $3,730 per month on average, while the nationwide average cost of assisted living is $4,000 per month, according to the latest figures from Genworth’s Cost of Care Survey. It’s important to note that assisted living rates in Martinsburg and the surrounding suburbs can vary widely based on factors such as location, the level of care needed, apartment size and the types of amenities offered at each community. 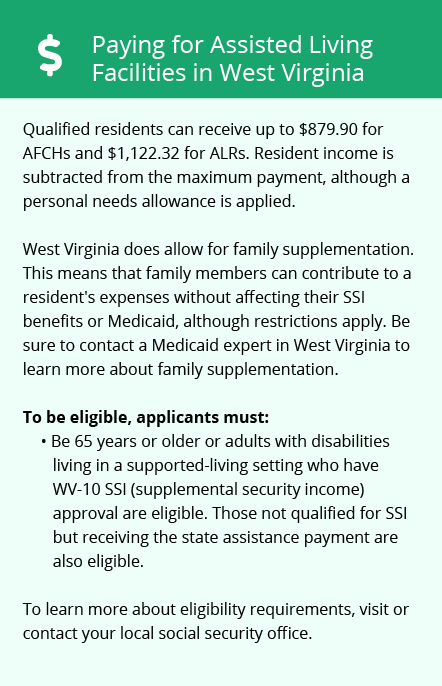 Seniors in Martinsburg have limited financial assistance options for assisted living care but may qualify for aid through the special needs circumstance waiver or Supplemental Security Income (SSI) program. Martinsburg West and the surrounding area are home to numerous government agencies and non-profit organizations offering help for seniors searching for or currently residing in an assisted living community. These organizations can also provide assistance in a number of other eldercare services such as geriatric care management, elder law advice, estate planning, finding home care and health and wellness programs. To see a list of free assisted living resources in Martinsburg West, please visit our Assisted Living in West Virginia page. 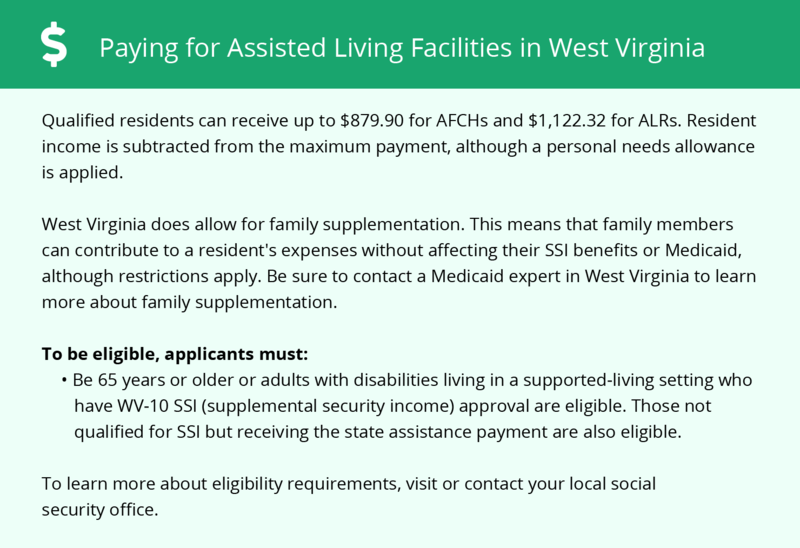 Martinsburg West-area assisted living communities must adhere to the comprehensive set of state laws and regulations that all assisted living communities in West Virginia are required to follow. Visit our Assisted Living in West Virginia page for more information about these laws.